I have been teaching pressure cooking for more than 15 years. I had been teaching so long that I had a body of recipes that needed to get out into the world. I also believe that pressure cooking makes eating better tasting, and healthier, food achievable for many people who may not possess the skills to be a good, or even, great cook. Additionally, cooking with a pressure cooker saves energy and I am concerned about the environment. People don’t have to think much about it but can feel good about doing something positive for themselves and the planet. It’s my way of giving back to Mother Earth. The New Fast Food contains all the information you need to learn how to successfully pressure cook. It includes cooking charts for beans, grains and vegetables, and 150 easy to cook recipes for dishes from breakfast through dessert. 138 of the recipes are naturally gluten-free. You’ll find recipes such as Three Minute Steel Cut Oats, Spicty Thai Carrot Soup (3 minutes), White Beans with Greens and Lemon (7 minutes at pressure), No-Stir Seasonal Risotto (5 minutes), Black Sticky Rice Pudding and Summer Fruit Compote. Jill shares her 15 plus years of pressure cooking teaching with you in this guide that will get you cooking to improve personal and planetary health. You’ll save time, money and energy. call this dish Farrotto. It’s easy to make your own broth which is key to great risotto. taking care to scrape up any browned bits sticking to the bottom of the cooker. let the pressure release naturally again. There is a lot of testing and fact checking that goes into writing a cookbook. You have to provide facts and be specific in writing recipes but you also have to engage the reader. Do your homework to be sure that you have an audience for what you are doing. Make sure that your recipes are tested and taste great. Figure out how you want your book to look and feel so that you get what you want. Also, be willing to let some of the recipes go if they don’t fit well into the structure of the book. I had a publisher which I subsequently fired because their time frame didn’t work with my goals. So, I decided to publish the book myself. I have my own publishing company and I took over the book project, hiring designers, editors, illustrators, etc. Do not self-publish your book unless you are willing to persevere. The writing is hard but selling the book is often even more difficult. There are expenses and it’s another business. 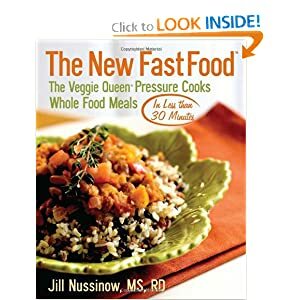 Jill Nussinow is a cookbook author, cooking teacher and Registered Dietitian who has two published cookbooks: The Veggie Queen: Vegetables Get the Royal Treatment and The New Fast Food: The Veggie Queen Pressure Cooks Whole Food Meals in Less than 30 Minutes. She loves teaching people how to cook food that helps provide more energy and makes them feel great.